Jo & Brad came to me just three days after getting engaged. They were so excited to get started and plan their perfect wedding! 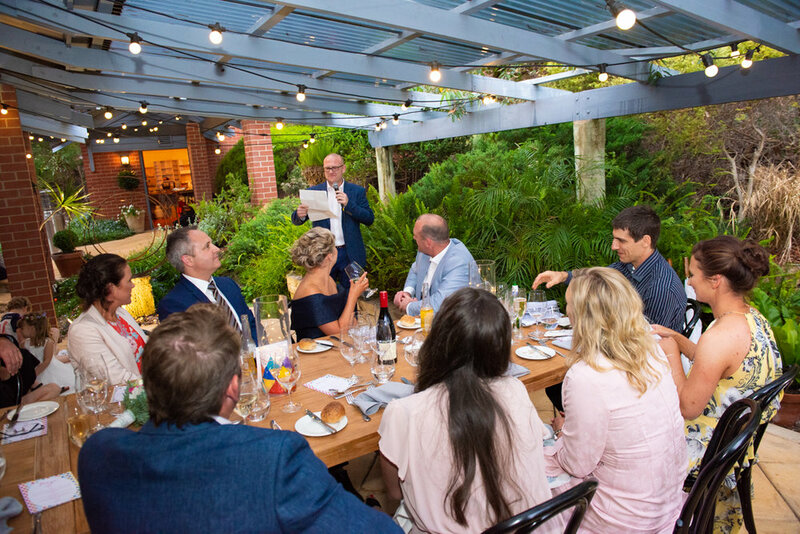 They wanted to spend the day at their beautiful home in the Adelaide Hills, with a formal dinner and dancing to follow the ceremony, held on their deck overlooking bushland. When the day came their was even a friendly koala on hand to complete the perfect scene. Jo and Brad met on a night out at the Bath Hotel and have been together ever since. When it came time for Brad to propose he surprised Jo with a very romantic event that included their family and Jo’s children, Alice and Jack. Jo described her wedding style as simple and elegant and wanted to keep the decor complementary to their mid-century modern home. 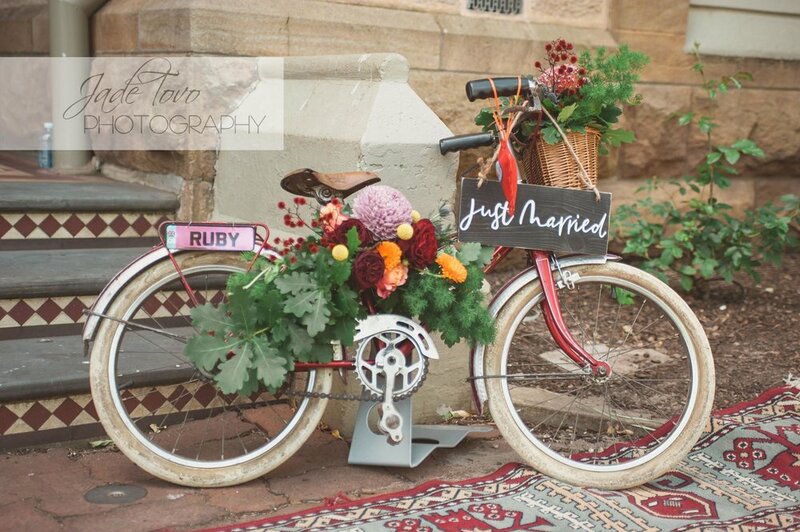 A really good choice, as a lot of the decor elements we needed were already there. Jo’s mum added a personal touch with the table centrepieces she created for the day. 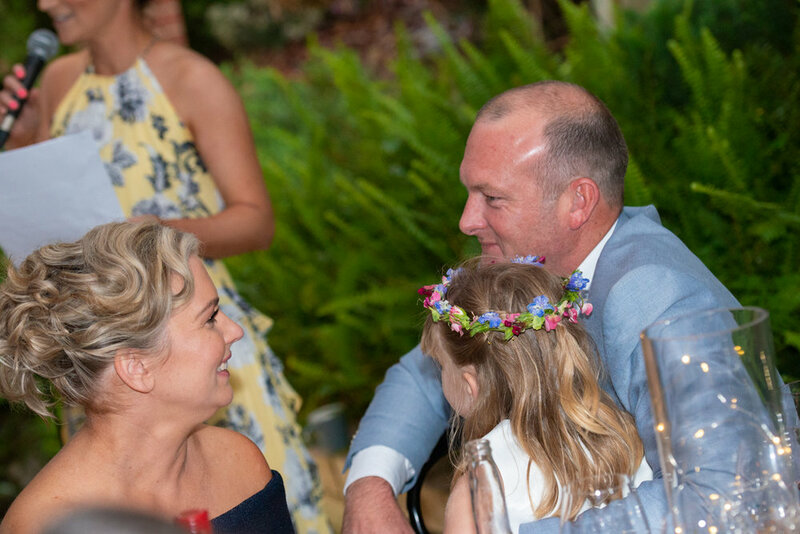 It was really important to both Jo and Brad that the children felt very involved in the wedding day and that it celebrated the four of them as a family. Alice chose to design the wedding cake and was credited as such on the dinner menus which she was extremely pleased about! Jack had the very special task of walking his mum down the aisle at the ceremony. A last minute addition of a marquee over the lawn, heaters, and blankets were added during the week before the wedding day, as unseasonal rains were forecast, and Festival Hire came to the rescue. One of the things Jo and Brad really wanted to do was treat their guests to a five-star meal and pair it with impeccable service. So we had the best of the best when it came to catering and service. Indulgence Food Design put together a seasonal menu for a three-course formal dinner and cooked on-site, and Are You Being Served manned the bar and took care of guests at their tables. Jo chose a navy blue off-the-shoulder dress for herself, and allowed her bridesmaids (her two sisters) and her flower-girl (Alice) to choose their own outfits. The bridesmaids each chose floral day-dresses in coral and yellow. Alice went all out with a very ‘bridal’ white tulle dress, that made her feel like a princess and twirled beautifully on the dance floor! Sarah and Mark came to me with a vision for a small, intimate wedding (‘around thirty guests please’) that simply celebrated their love without too much fuss. Over the next few months as we started booking things in and talking through ideas the wedding vision kept getting bigger (‘around one hundred guests we think’) and more and more fun elements were added all the while insisting that this was going to be small and simple. 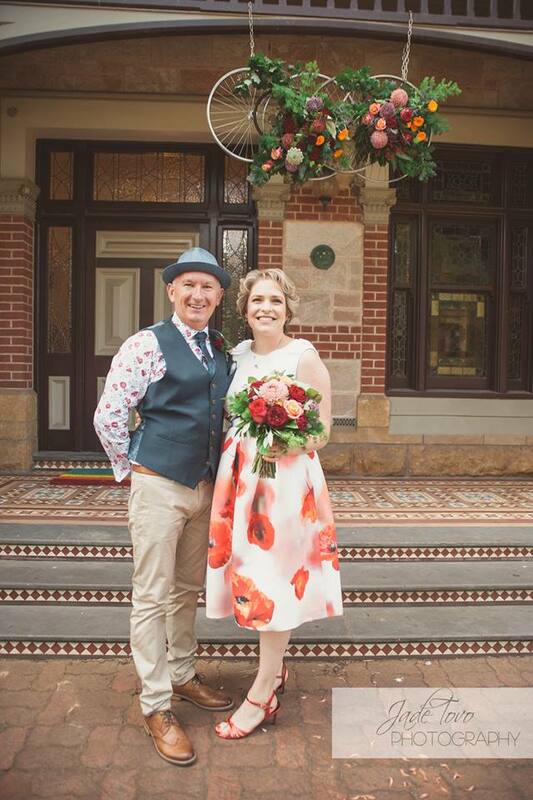 Finally, we had a glorious, colourful, multi-layered wedding day planned for more than one hundred and fifty guests and Sarah laughed and said ‘It seems we are having a real wedding after all!’. It was all put together with so much love and care, it truly celebrated Sarah and Mark’s personalities and passions, and guests were treated to a day out at a fun and relaxed fete, with great food, beautiful vintage decor, and a blisteringly good band to dance the night away under the stars. Sarah and Mark met when they were out on a bike ride, both of them love cycling and are out there exploring new tracks every weekend. So their first date was no surprise, a trip to Clare to see a cycling event. 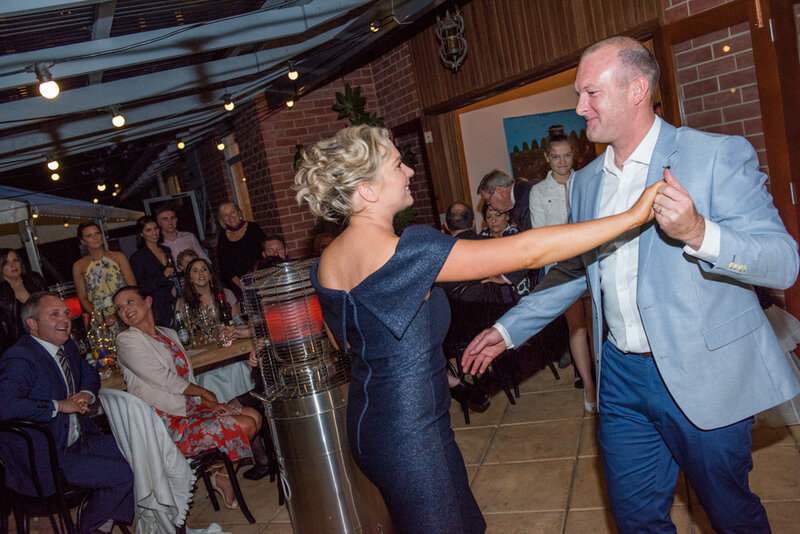 Mark proposed to Sarah at her fortieth birthday party, and got down on one knee in front of all their family and friends. The search for Sarah and Mark’s wedding venue was long as it needed to fulfill quite a few requirements. They needed somewhere family-friendly because they wanted to be able to invite all the children in their various circles and make sure they had as good a time as the adults, it needed to have several different areas available to set-up the day they had in mind, it needed to allow them to bring their own catering, and they wanted an outdoor venue with an indoor back-up in case of extreme weather. It also needed to fit the design brief of ‘Carnival Chic’. When we visited Carclew together for the first time we looked at each other and both had the same excited look in our eyes ‘This is the place!’. 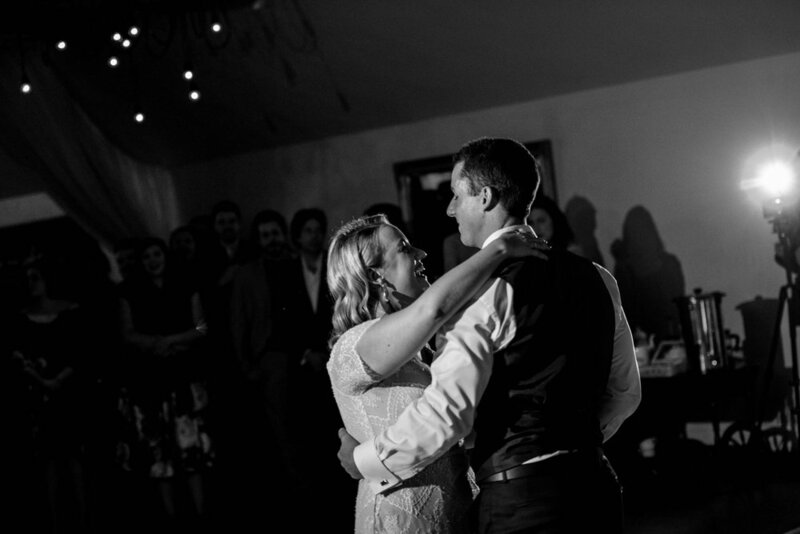 The priority on this wedding was to ensure guests felt relaxed and give them a great time. However, we also placed importance on making it look very ‘Sarah and Mark’ and this meant incorporating lots of design details around their love of cycling, their three year old daughter Ruby who was also a big part of the day, and their family dog, Harriet the short-haired pointer. A few of the best details included an enormously long dessert table filled with an equally enormous variety of desserts for guests to graze on later in the evening, some truly inspired floral design, and a specially-decorated bike for Ruby to make her grand exit parade on at bedtime, to the cheers of all the other guests. The celebrant entered the ceremony on a unicycle and almost upstaged the bride and groom! Sarah didn’t want to wear a traditional wedding gown and it really wouldn’t have fit her wedding vision anyway. Instead she visited a few of the stores she regularly shops at where she knew their cuts and style suited her and chose a gorgeous party dress from Ted Baker. As flowergirl, Ruby also wore a party dress to complement her Mum’s. 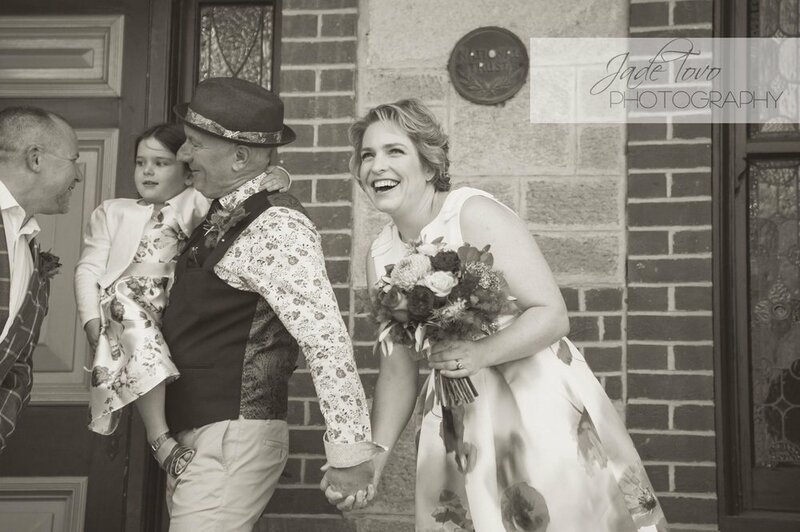 Today I'd like to introduce you to one of my fave Adelaide celebrants, Michael Elwood. 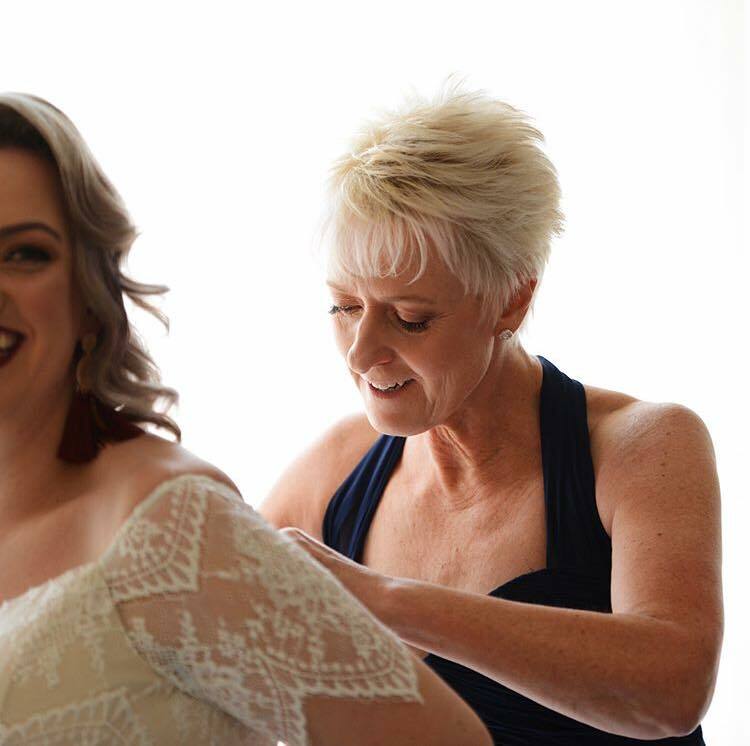 When you consider that the celebrant you choose will perform the most important task of your entire wedding day (getting you legally married!) you realise how vital it is that you find someone who understands your vibe, who makes you feel comfortable, and will make the journey easy and stress-free. I had wanted to be a celebrant from the time I was in my mid-50s, as I occasionally thought about what I would do in 'retirement'. I knew that sitting around was never going to keep me occupied, with my brain working. My working life involved managing several major arts organisations - mostly in music and then in film. Later in working life I ran charity organisations in international aid then disability. So I became an Authorised Civil Celebrant in late 2009, and since then have conducted over 300 ceremonies. I am a 'people person', so find it very easy to converse with and relate to people. So working with people to help them achieve something special for their marriage ceremony is a real 'buzz' for me. So many couples come to me not knowing what a wedding ceremony could be like - often with a very limited view, and sometimes never having attended another ceremony. 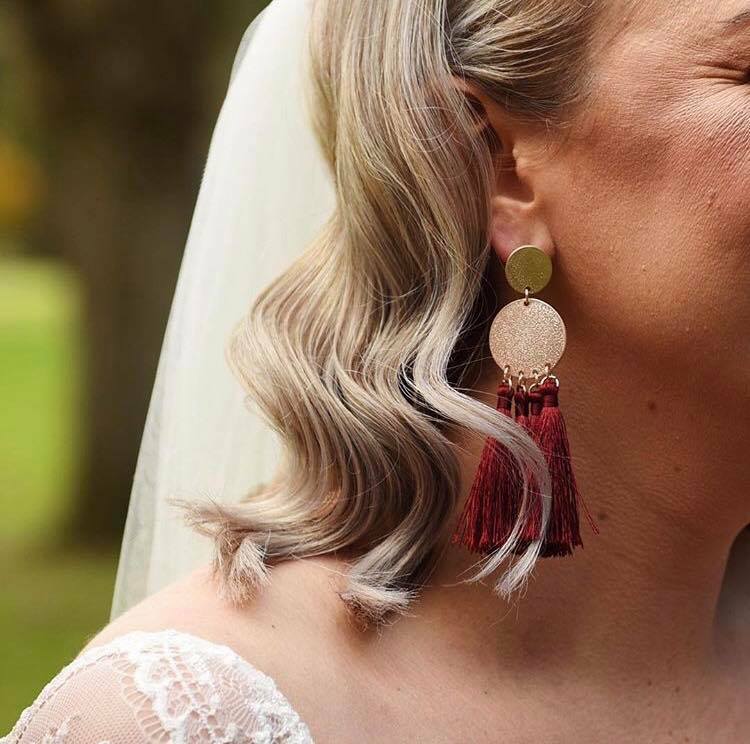 So it is incredibly rewarding when a couple get really excited about the ceremony that we have worked on together that reflects their wishes and personal style. And then when they write reviews of my work, I get a great sense of joy at enabling people to create something beautiful and memorable, that will remind them of the most important day of their lives. I always start by trying to find out as much as I can about the couple - what is their style, have they seen something that they really liked, importantly have they seen things that they definitely DON'T want. Will the ceremony be traditional and formal, or more relaxed and gentle, or do they have any particular theme that they would like to work within. Then I have a template of different elements that can form part of a ceremony, so we talk through those ideas. I provide the couples with a large file (electronic) of sample wedding and ring vows; readings, possible rituals and traditions, and I emphasise that a ceremony can be as complex or as simple as they wish - they have the choice and great flexibility. I usually ask them to consider the materials that I have provided to them for between two to four weeks - depending upon their schedules, and come back to me with any suggestions that they might like to include. I then start to build a ceremony around their choices, and send back a first draft asap. We then email back and forward as much as necessary until they feel that they have something with which they are pleased. They may not have written their personal wedding vows at that point, they like the general shape and content. If time permits, I encourage them to put the draft away for a few weeks or months, and then come back to it with 'fresh eyes', and see if they still feel happy with what they have. From there we try to finalise the ceremony, hoping to have it all complete at least three or four weeks before the big day, so that there is no panic when the schedule of the last few weeks arrives. Of course, I am happy to make any little (or big) changes right up until the last minute. 3. Check to ensure that you have a fixed price agreement, and that it is fully inclusive. 3. 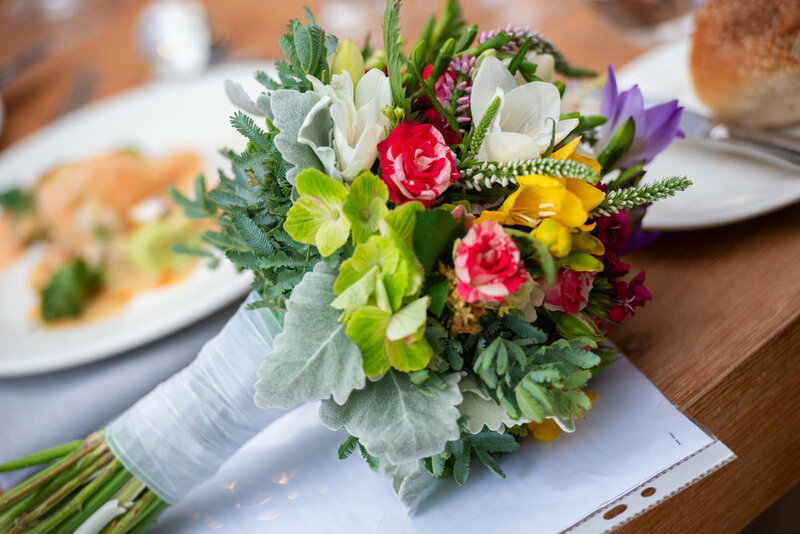 If you have time, research widely the wedding suppliers that you feel you will need - ceremony venue, reception venue, photographer, celebrant, wedding planner. 4. Give serious consideration to engaging a Wedding/Event Planner - they are a wealth of information about so many of these things. If you do engage a wedding planner, then you are taking a lot of weight off your shoulders, especially as the time approaches, and you already have so many other things to think about. I am a foodie and love cooking for people, enthusiastic, out-going and talk to anyone, have a sometimes quirky sense of humour, but laugh easily, love people, and dedicated to my family. I just love these two! They're genuinely so much fun to be with, and their love for each other is so obvious in the way they look after each other's needs. 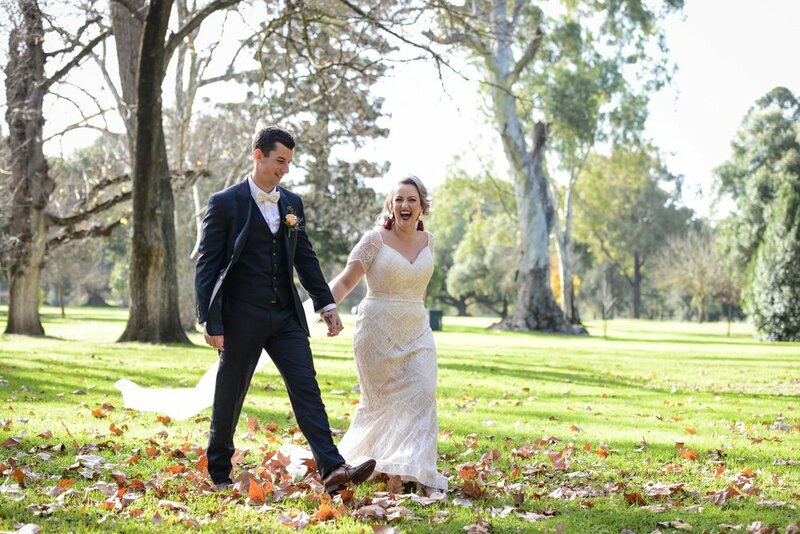 Emma + Josh met seven years ago when they both worked at Woolworths. Josh took Emma on a date to Zapata's Mexican Restaurant to catch up after he left Woolies. Emma had no idea they were even on a date, and she hates Mexican food, so she suggested they head to Elephant Walk next door for dessert (she has a HUGE sweet tooth). Josh thought she was indicating she was keen because of the dark lighting and private booths, so he kissed her whilst they were awaiting their order! Emma was completely shocked, but it worked because she and Josh have been inseparable ever since. - Walking towards Josh for our first look. - The photographer, Joel, hiding in the tree out the front of our house to take photos. - Nat from Ten22 sneaking me out whilst everyone was waiting for me to walk down the aisle so I could check out the set up – I was speechless! - My dad getting tangled in my veil and dress and tripping over me once we reached the end of the aisle. - Josh’s oopsie in his wedding vows where he declared he likes waking up ‘behind me’ rather than beside me. - Photos in the middle of South Road at 10pm – it was freezing! Poor Joel copped a bit of abuse… even from his assistant. - Our Uber driver on the way to the hotel asking us whose birthday party it was we went to… while I’m sitting in the car still in my wedding dress. What was the best decision you made when planning your wedding day? The best decision we made was to not DIY anything and to have Emma do all the ‘heavy lifting’! We didn’t have to fuss around with set up or pack up and really were able to enjoy the lead up to the wedding. My biggest advice for future brides and grooms is to not waste time attempting to please others - remember who and what the day is about for you as a couple and invest your energy accordingly. Look, we're all modern women here right? Online shopping is awesome - it's convenient, easy, and so much fun when that little gift to yourself arrives promptly on your doorstep! But we can probably all admit to having been caught out on occasion by a few of the pitfalls too. The sizing is wrong, it doesn't look like the pic online, and all of a sudden there's no way to contact the site for help. Shopping for your wedding gown is no different, and there are a lot of designers selling online (sometimes exclusively), so what to do if you've fallen in love with a dress you can't take off the rack and try on before putting your hard-earned cash down? It's one of the most important wardrobe purchases you'll ever make and fear not, I'm here to make it easy for you. Follow these tips and you can't go wrong! Yep, jump online and start doing some detective work on the brand's social media. If they have no social media, then just stop, we're done here. There's no reason why an honest, reliable brand wouldn't have up-to-date accounts. Look for recent, frequent posts and feedback from previous brides. Next-level stalking involves sending off a message (perhaps a query regarding the dress you love) through their 'contact' button and waiting for a quick, informative reply. If they can't tick all these boxes then back away girl! Before purchasing from any online store, you need to thoroughly check the terms & conditions and make sure they work for you. I know, super-boring, but also super-helpful in times of crisis! Key points to read up on include delivery times, shipping charges, and the returns policy. If you're unsure about sizing, a flexible returns policy allows you to order two dresses and return the one that isn't right. While we're on that, make sure there is a good sizing chart available to you, and it's not a bad idea to have a good dressmaker measure you properly too. If your dream dress arrives and it fits perfectly, then hurrah, pop the bubbles! If not, don't despair, remember that dressmaker who took your measurements? Go back and ask if she can now make the alterations you need. Even when buying off the rack, most brides have to get alterations done, usually to the length at least (hands up all my fellow short girls! ), so it's nothing to worry about. I cannot emphasise this one enough ladies. If your bridesmaids are buying online, then please, order them all together. I know it can be tricky to organise and it will seem easier to let each girl do it at their convenience, but just don't okay? One order for all will mean your dresses are made from the same dye lot (avoiding slight colour variations), they will all arrive at the same time (making alterations so much easier), and there is no chance that someone leaves their ordering too late only to find the dress is no longer available. Disaster my friends! There's no doubt this adds an extra layer of complication, but it's nothing that can't be dealt with fairly easily, and a new little one should be celebrated! The general rule is to jump up two dress sizes when ordering for pregnant women. This gives room for the lovely bump to expand without the mother-to-be stressing about how her dress will fit. A gown that is too big can always be taken in and fitted to suit, but a garment that is too small can be almost impossible to make work. Do you have anything to add to these tips? I'd love to hear from you!